You say in stock soon. How soon is soon? Great question Dennis! 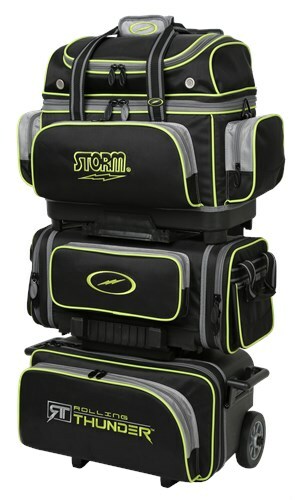 The Storm Rolling Thunder 6 Ball Roller Black/Grey/Lime should be in stock by the end of this week. Any update on when it will be shipped to the people who pre-ordered. The bags are in stock and should be shipping! Can the middle bag be removed and the top bag dropped down to use as a 4 ball bag that still carries shoes? Unfortunately this cannot change to a 4 ball roller. The middle bag and top bag will set on a platform which is fixed to the handle and cannot be removed. So you could not remove the top platform and convert this to a 4 ball roller. Are the wheels on this bag the Kruze wheels that are also found on the KR Strikeforce 6 ball roller? How durable are these wheels? Hello Allen! Yes, you can detach the bags to make it easier to load into your car. Hi. Yes, the top tote will be detachable. Hello Loren. Yes, the handle is retractable. Yes, the top part of this bag will be removable and can convert into a 4 ball roller. What keeps the balls in the middle bag from moving? That would the middle bag rack and the center latch that keeps it together and not moving. Due to the time it takes to produce the Storm Rolling Thunder 6 Ball Roller Black/Grey/Lime ball it will ship in immediately. We cannot ship this ball outside the United States.